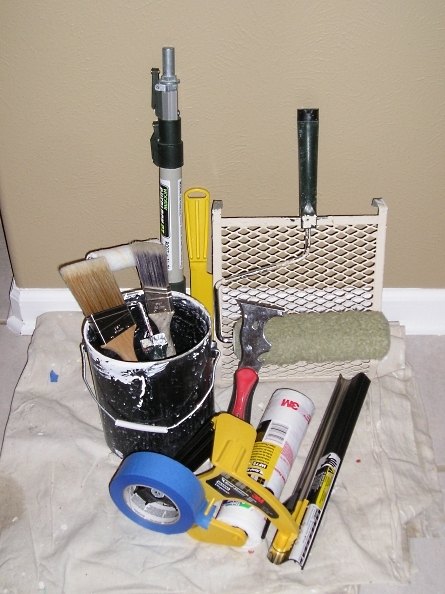 Basic set of tools used by professional painters. The most beautiful finishes are the result of more than just the paint. You need the best interior painting tools to achieve the best results. Even a novice can achieve excellent results by using professional grade tools. You may already have many of these tools needed for painting a room. Some of the tools you need depend on the amount and types of preparation needed. For example, if you can’t remove all the furniture from the room, you will need lightweight plastic to cover the furniture. This will protect the furniture from paint spills or spatters. If there are small nail holes in the wall, a putty knife and spackling paste will make quick work of filling the holes. The sanding block with drywall screen will smooth out any ridges left after the spackling paste dries. Sand paper smooths out old paint drips and other minor irregularities. A hand held masking machine with masking paper or plastic film can make the job of protecting windows and trim quick and easy. There’s nothing like paint spatters on glass or trim work to make a paint job look unprofessional. Other interior painting tools, like an airless paint sprayer or HVLP unit are optional for most jobs. An airless paint sprayer tends to use more paint. For smaller single-room interior paint jobs, the time savings rarely justifies the extra preparation time you must take to set up for the airless paint sprayer. A basic set of professional painting tools (including the right kind of brushes and professional paint rollers) will make your painting job go much faster. And the end result will look better when you use quality tools.